Dairy-Free Girl Scout Cookies: Ingredients, Allergen Information & More! You are at:Home»News»In The News»Dairy-Free Girl Scout Cookies: Yes, They Do Exist! Updated for 2019! ~ Some of you may try to argue me (read on for the reasons why), but yes, there actually are dairy-free Girl Scout cookies. 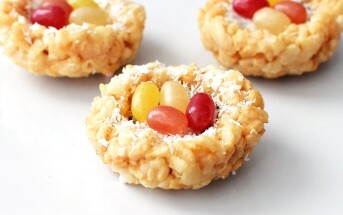 In fact, these gems are labeled as egg-free and vegan, too. I know what you are thinking, “Sure, they have one measly tasteless wafer cookie, right?” Au contraire. This infamous cookie collection now has five cookie varieties that are made without milk or egg ingredients! An email from my sister soliciting purchasers for my nieces’ girl scout troupe, piqued my curiosity and prompted me to do a little research. For years I have been able to politely turn down those cute little requests to purchase cookies in front of the grocery store without a pang of guilt, but it seems my milk-free excuse might have run dry. At last check, the following Girl Scout cookie varieties were made without milk and egg ingredients, and were also vegan by ingredients. Please see the next section for full ingredient lists, allergen notes, and more. 2019 – Same cookies, no major updates. ABC Bakers added a gluten-free Caramel Chocolate Chip cookie, but it isn’t dairy-free. 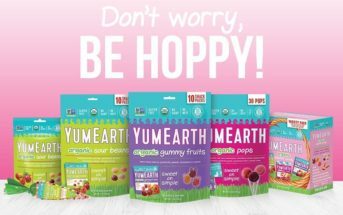 2018 – Same cookies, but we added ingredients and allergen notes here and the ABC corporate name and website changed. 2017 – The Cranberry Citrus Crisps were discontinued, but vegan Girl Scout S’mores were introduced. 2016 – All of the dairy-free Girl Scout Cookie options remained unchanged. 2015 – The Little Brownie Bakers manufacturer changed their Thin Mint formula to be kosher pareve. This makes Thin Mints the first nationwide dairy-free Girl Scout Cookie offering. The Girl Scouts added a new gluten-free cookie too, but alas, it isn’t dairy-free. 2014 – To make room for new Cranberry Citrus Crisps in the dairy-free Girl Scout cookies 2014 line-up, the Mango Crèmes were discontinued. 2013 – The Mango Crèmes replaced the short-lived Belgian-style Shout Outs! There are two Girl Scout cookie manufacturers, both of which list the cookie ingredients on their websites. The above mentioned cookies are all produced by ABC Bakers. Interestingly enough, the core corporation behind ABC Bakers also runs a company called Norse Dairy Systems, but that is another story. The other manufacturer, Little Brownie Bakers, changed the formula of their Thin Mints for 2015, so that they are now dairy-free! As of our most recent review, Thin Mints are the only dairy-free Girl Scout cookies made by Little Brownie Bakers. Do not mistake their Tagalongs and Girl Scout S’mores, which do contain dairy, for the Peanut Butter Patties and Girl Scout S’mores made by ABC Smart Cookies. Since my sister’s list of cookies available included all of the Little Brownie Bakers selection and none from ABC, this leads me to believe that the two companies split up who they supply to either by region or troupe. Sadly, this means your local troupe may not have ABC’s dairy-free Girl Scout cookies selection. 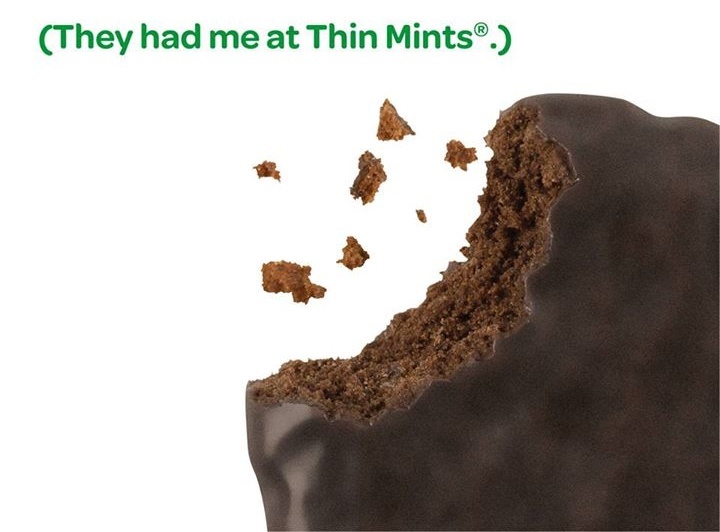 If you’re craving more than Thin Mints, check online. I did spot a few troupes selling them on Ebay (is that in the rules?). Also, I’ve heard rumor that troupes may be able to request who the cookies are ordered from. Girl Scout S’mores (by ABC Bakers) – Sugar, enriched flour (wheat flour, niacin, reduced iron, thiamine, monoitrate, riboflavin, folic acid), vegetable oil shortening (palm kernel and palm oils), cocoa (processed with alkali), cornstarch, molasses, high fructose corn syrup, leavening (baking soda, ammonium bicarbonate, sodium acid pyrophosphate), salt, defatted soy flour, soy lecithin, artficial flavor. Allergen Information: This product is manufactured on equipment that processes products containing milk, egg and peanut. Lemonades (by ABC Bakers) – Enriched flour (wheat flour, niacin, reduced iron, thiamine mononitrate, riboflavin, folic acid), sugar, vegetable oil shortening (palm kernel and palm oils), cornstarch, corn syrup, natural and artificial flavor, salt, ammonium bicarbonate, sodium acid pyrophosphate, baking soda, soy lecithin, annatto color, citric acid, malic acid. Allergen Information: No cross-contamination warning shown online, but according to the ABC website, all of their cookies are certified kosher OU-D.
Peanut Butter Patties (by ABC Bakers) – Sugar, peanut butter (peanuts, corn syrup solids, palm oil, salt), enriched flour (wheat flour, niacin, reduced iron, thiamine mononitrate, riboflavin, folic acid), vegetable oil (palm kernel and palm oils), cocoa (processed with alkali), high fructose corn syrup, baking soda, soy lecithin, salt, monocalcium phosphate, ammonium bicarbonate, natural and artificial flavor. Allergen Information: This product is manufactured on equipment that processes products containing coconut and milk. Certified kosher OU-D.
Thanks-A-Lot (by ABC Bakers) – Enriched flour (wheat flour, niacin, reduced iron, thiamine mono-nitrate, riboflavin, folic acid), sugar, vegetable shortening (palm kernel and palm oils), high fructose corn syrup, cocoa (processed with alkali), salt, modified corn starch, ammonium bicarbonate, baking soda, artificial flavor, soy lecithin, sodium acid phosphate, corn starch, mono-calcium phosphate. Thin Mints (by ABC Bakers) – Enriched flour (wheat flour, niacin, reduced iron, thiamine mononitrate, riboflavin, folic acid), sugar, vegetable oil shortening (palm kernel and palm oils), cocoa (processed with alkali), caramel color, high fructose corn syrup, salt, baking soda, soy lecithin, peppermint oil, natural and artificial flavor. Thin Mints (by Little Brownie Bakers) – Enriched flour (wheat flour, niacin, reduced iron, vitamin b1 [thiamin mononitrate], vitamin b2 [riboflavin], folic acid), sugar, vegetable oil (palm kernel, palm, and soybean oil), cocoa, caramel color, contains 2% or less of cocoa processed with alkali, invert sugar, leavening (baking sode, monocalcium phosphate), cornstarch, salt, sorbitran tristearate, soy lecithin, natural and artificial colors, oil of peppermint. Allergen Information: No cross-contamination warning shown online and certified kosher parve. The above mentioned cookies produced by ABC Bakers are all certified kosher OU-D. They are made without milk ingredients, but the “D” likely means that they are processed on shared equipment with other milk-containing cookies. 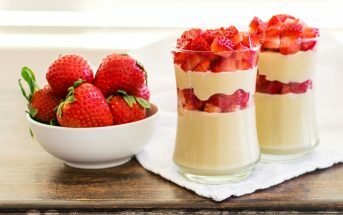 If you are dealing with a severe milk allergy or intolerance (or if you are concerned about cross-contamination of ingredients during the manufacturing process for any reason), then you must double check with the company to see if their processes are “safe” for your needs. Milk Allergy Mom weighed in on her own experience several years ago, but every person could be different and processes can change. The Thin Mints made by Little Brownie Bakers are certified kosher pareve, but that still doesn’t guarantee safety if potential cross-contamination with dairy is a concern for you. Always contact the company! Unfortunately these boxes of “American tradition” contain some not-so-traditional ingredients. All of the varieties mentioned above contain hydrogenated oils and most contain high fructose corn syrup and some artificial ingredients. While I hesitate to actually recommend them from a health perspective, I do recognize the importance and symbolism of Girl Scout cookies for millions of people! Hello! So are the peanut butter parties just like tagalongs? Or the tagalongs different? Do you know is savannah smiles are dairy free, I’m assuming the lemonaides are different? I see that it depends on where the cookie is manufactured. Are the s’mores dairy free regardless where they’re manufactured, like thin mints? Please read the post thoroughly Meggan, and see the links for ingredient information. They still have corn syrup and other fake foods so just pay for them and have the girls shop them to our troops. You’re supporting worthy causes and sparing your health. The cookies aren’t as tasty and addictive as they used to be before switching to cheaper ingredients anyway. Still contain soy. Soy is the second food allergy behind wheat. I love thin mints but will not be buying any. I’m allergic to soy. You mentioned that the Thin Mints and other ABC cookies have an OU D on the box. No, the Thin Mints do not. I am looking at a box right now that I just bought, they only have an OU on them which means that they have no dairy in them. OU D means that there is dairy in the cookies. OU DE means that the cookies share the same equipment that other cookies with dairy were made on or in. I am an orthodox Jew so I think I know what the Kashut symbols (OU/OU D/OU DE) means. Sometimes, the manufactures do make mistakes so its a great idea especially for observant Jews to read the ingredients and anyone else who is worried about cross-contamination. 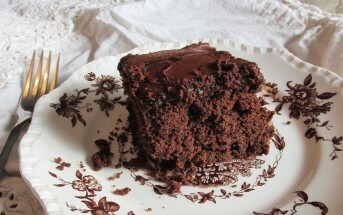 Thanks ME – actually, “D” can simply be shared equipment, it doesn’t necessarily mean there are dairy ingredients inside. It depends. Good to know they are going pareve with the ones you found – I will need to verify this with the manufacturer though. I appreciate your comment! Was it truly necessary for your point to be made so rudely? The thing most people seem to be missing is that when some cookies say vegan, it’s really vegan version AVAILABLE. You have to be sure your local girl scout has the ones you want. This year I hear the girls will be using websites, so hopefully that will make clear which ones have which ingredients. They should come up with a specific line in certified facilities so they’re safe for everyone with allergies-not just some. They should leave the old cookies alone. This helped me figure out why the thin mints in our area got thrown away last year? Definitely don’t taste the same! I wish they would consider a line of gluten free and vegan girl scout cookies. Hi Brenda, I’m not sure where you read that online, but they need to correct their facts! Read my post above for a full explanation of the cookies available that are dairy-free by ingredients, allergen concerns, etc. The Tagalongs are make by Little Brownie Bakers and do contain milk like almost all of their cookies. Hi Kimberly – see the post above – Tagalongs are still Tagaongs, but they are made by Little Brownie Bakers and contain dairy. As noted in the information above, Peanut Butter Patties are made by ABC Smart Cookies and are vegan. Use caution with the two different producers as I’ve written! my child who has a dairy allergy had a reaction to the new vegan girl scout thin mint cookies. the cookie manufacture should list on the box if they are manufactured in a facility that contains dairy. Also I was a little confused because the order form said Vegan beside the Think Mints but the there is no Vegan label anywhere on the Thin Mint box. They do disclaim on their website, as I note here, that they process all of the cookies in the same facility. And the cookies are certified kosher dairy for dairy equipment. If you are dealing with a life-threatening food allergy, always contact the manufacturer before consumption to ensure that you are comfortable with not only the ingredients, but also the processes. It isn’t enough to simply rely on the packaging, as the labels are not tightly regulated. I do hope that your daughter is well! a little confused how you can say they are dairy free and vegan if it shares same equipment as dairy products. I have a daughter allergic to dairy and this is very misleading. Hi Misty, please see the post (read it in full) and please discuss with the manufacturer on safety! I’ve even linked to a personal story from another milk allergy mom. They actually label the product as vegan as you can see in the picture (I did not add that vegan stamp!). Since you are dealing with a severe allergy, it’s essential to understand that most products are at risk for cross-contamination in production, even ones produced in an allergen-free facility. It is not up to me to determine what is “safe” for each individual person. 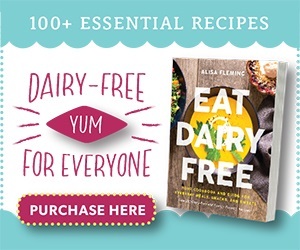 As noted through the website and below, we share what is dairy-free “by ingredients” as processes can change and there is no way to even know what a safe limit is for each person (plus, there are also allergic reactions like EoE or lower grade IgE where traces of an allergen are still safe). Also note that their certification is OU-D – OU is know as one of the strictest kosher certifications. Just because something is made on shared equipment, doesn’t mean a company doesn’t follow strict allergen protocols and batch testing. All of this is beyond the scope of what I can research for each person. It is up to each individual to decide what products are safe for them and their family. I do know of several moms with milk allergic children who feel that these dairy-free Girl Scout cookies are safe for their children, but only you can decide if it is safe for your own daughter. sorry I did not mean you personally you are just delivering the info. I have contacted manufactures on this problem in the past. I agree you have to read labels but also understand what you reading. I feel people will see the word Vegan and not read anything else. thank you for the info. Hi Misty, thank you so much for the response! Whenever anyone poses allergen issues at me, I have to take it seriously – I’m glad we’re on the same page though! Different areas only sell certain cookies. My daughter just became a girl scout and our area is currently in the midst of cookie sales. However, we only offer one vegan cookie in this area. Fortunately, it is the Thin Mint! This was not traditionally dairy-free, but I am willing to bet it tastes awesome. Unfortunately, that is the only dairy-free cookie option that I have. We do not offer the other cookies you listed. I live in Ohio and my daughter is part of the North East Ohio council. I can give the web address if people would like to order from her online and have the cookies shipped directly to you from the warehouse. I don’t want to put the address without permission though. Also, we have a new gluten-free cookie that you did not mention that is being trialed only in certain councils this year. We will have limited amounts of Toffee-Tastic to sell at cookie booths. However, they are not dairy-free. They are only listed as gluten-free. That is the only gluten-free cookie offered in my area and is not on the traditional sales sheet, it is only going to be available at cookie booths. Our cookies are from Little Brownies Bakers. I wish we had more dairy-free options, but I am glad that we have at least one this year. Hi Barbara, yes, I did mention that gluten-free cookie in this article (see above!) – just to note that it is not dairy-free. This list is for dairy-free girl scout cookies! Indeed, as noted above, the two manufacturers service different troops and regions, but they can be ordered online from many! Great! Thanks for sharing Jennifer! The Cranberry Citrus Crisps may have not been labelled Vegan because, unlike the other cookies mentioned, they are made on shared dairy equipment. 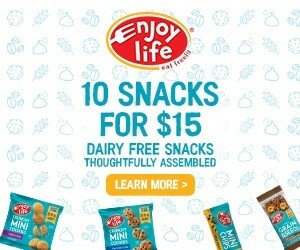 I wish that they had this many dairy -free options when my daughter sold them, but I am happy to buy them (or donate them) now! Hi Gretchen, unfortunately all of them are certified OU-D – made on dairy equipment (see my note above on that issue). I’m guessing it has something to do with either the sugar sourcing or one of the “added” ingredients. If they don’t list what type of sugar they use, how can they be considered vegan? You’d have to take that up with ABC Smart Cookies – they state vegan on the cookies. I am looking at a box of Thin Mints from “Little Brownie Bakers LLC” (out of Louisville, Kentucky) right now, and whey is listed in the ingredients. Is it that they did not change their packaging? Or that different lots were prepared differently? The box I have has “Sept 01 2015” printed on the top. My vegan potential customers will not buy/eat them is whey is in the ingredients list. 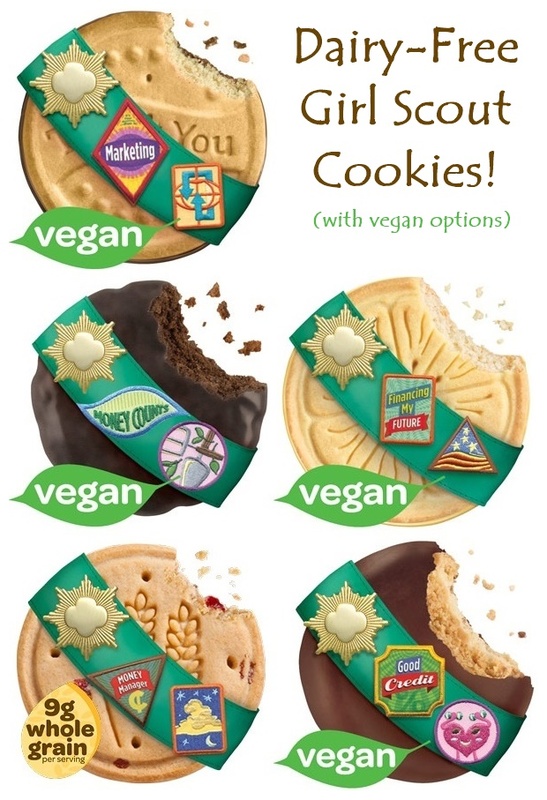 This year the Thin Mints from Little Brownie Bakers are vegan. Although it is the only one that is vegan from this baker. They took the whey out. Box will not be labeled vegan, but you can check the ingredients. Hi Julie – thank you! Yes, I had heard and will be updating this post for 2015 shortly. I appreciate you helping to keep me in the loop! I have been 100% Allergy to Dairy all my life. So all these Dairy Free foods are a great thing. The only trouble is some of them taste terrible and they are much more expensive. I will now try the Girl Scout cookies.